Learn how to make this cute little amigurumi crochet pig using a step by step video tutorial and written instructions. According to Chinese zodiac, 2019 is the year of pig. Pig is the 12th in the 12 year cycle of zodiac sign and we will be celebrating this new year with different kind of pig toys and accessories. That’s why today we’ve decided to cheer you up with one of the cutest crochet patterns I have ever worked with. This is a fresh new crochet tutorial for beginners. It’s quite simple and easy to follow, so I’m sure you’ll handle it without any difficulties. Just follow the crochet directions and learn how to make these lovely pig and boar for yourself and for anyone dear to your heart. Good luck and happy crocheting. 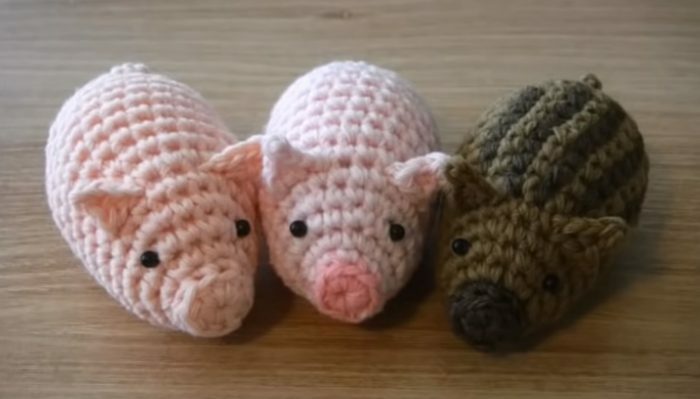 2019 is the year of pig according to Chinese zodiac, so you might want to learn how to crochet some of the cutest pigs in the best possible way. Just follow the step by step tutorials and celebrate new year with these lovely amigurumi crochet pigs.